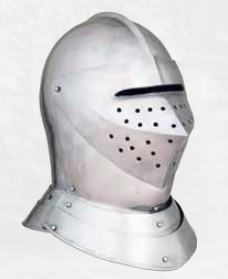 helmet consists of a tubular head protector, connected to hinged gorget, which rests around the collar, providing the highest degree of protection to the head and neck possible. The top of the helmet also features a small central ridge, which helps to shunt blows off to the side, ensuring that they do not land solidly atop the head and instead are diverted down the sides of the helm, reducing their impact. All close helmets possess a visor of sorts, and on this jousting model, the visor features a narrow, long eyelet, as well as small cut-out holes to help with helmet ventilation when the visor is lowered. This helmet can be ordered in either 18 gauge or 16 gauge steel (18 gauge is suitable for costuming and LARP combat, while 16 gauge is more suitable for light reenactment, LARPing, and some SCA). This page was last modified on 1 November 2013, at 17:42.